It’s red – the hat – and must have felt hot on Saturday. Every day gets hotter. 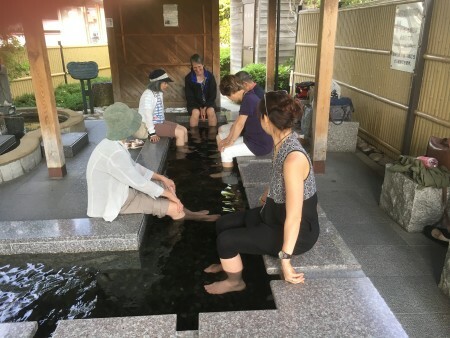 We don’t have time to travel up and down the Ichibata Railway Company’s Electric Line, that potters between the paddy fields and stone-eyed shrines, to sample all the onsen and hot spring footbaths that pepper the route. 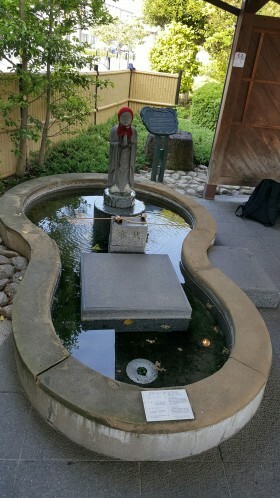 But we do stumble, weary, into the Footbath of our Lady of the Woolly Hat in Matsue. Every new pilgrim groans in shock and delight at the heat of the water. Blood heat from Mother Earth. As we’re about to depart, reluctantly, one man paddles out and walks onto the stone in front of the goddess. Hunkers like a frog. 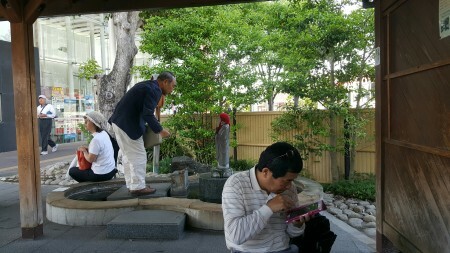 With a tiny bamboo scoop that lies there, he scoops up water and bathes her tiny stone feet. She’s been standing there some time. Much time. Beyond time. Her feet must really ache. Someone has to think of her comfort and ease. Our feet are reborn. Good for miles yet.